This beautiful 56-foot sailing catamaran can accommodate up to 55 people, and is available for sunset cruises, booze cruises, snorkeling trips, or any other type of tour that you desire. This excellent boat will be yours, PRIVATE just for your group, fully crewed for your enjoyment, ready to provide you with an unforgettable adventure in Puerto Vallarta. The catamaran is loaded with every comfort imaginable and every water toy to make a day of fun in the sun as adventurous or relaxing as you want it to be. 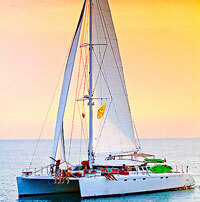 Sailing, snorkeling, fishing, whale watching, partying and dancing, romance, whatever your heart desires. With comfortable deck cushions, marine bean bags, two large front trampolines and an incredible boom net making Puerto Vallarta's largest natural jacuzzi, you will enjoy an amazing day or evening in paradise. Food and drinks are available to your needs, with all-you-can-drink open bar our most popular option of course! A fun-loving crew, a gorgeous natural backdrop, and inflatable water toys, make this the perfect venue for your group of up to 55 people! The rates on this boat change by the season, so in order to give you the best price possible, please email us for a quote and we'll get back to you shortly!